Nanoxia reveals the Deep Silence 1, a new mid-tower with some pretty nice features. Years ago, with the launch of the legendary Nano-Bearing fans, we dedicated ourselves to the development of innovative, high-quality must-have products. 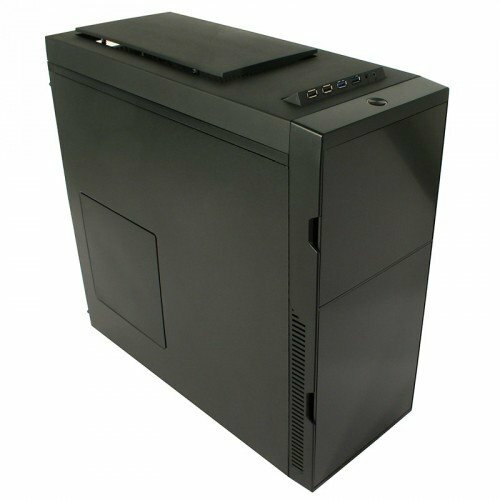 With the launch of the Nanoxia Deep Silence 1 PC Case this development now finds its logical evolution. In accordance with current requirements, this innovative tower - as the foundation for a whole new line of future products - offers the perfect symbiosis of ideal system cooling and sensationally low noise levels – especially for the use of high-end PC-systems. Exquisite looks and timeless elegance characterize the appearance – the Deep Silence 1 is deliberately simple in design. Common controls were inconspicuously integrated into the exterior surface, maintaining the linear design flow. The high performance demands on a case of superior quality have been taken into account with the Nanoxia Deep Silence 1. The I/O-panel can be found on the top cover of the case with 2 x USB 3.0, 2 x USB 2.0, Mic, and Audio connectors available. The panel can easily be embedded in the cover if the connectors are not needed. The cover also mounts the unique Nanoxia Air Chimney for effective case ventilation. Again, this is easily retractable. This ensures that the simple look of the case is maintained, without sacrificing useful features and options for ventilation. In the course of the many years of development work which culminated in the Deep Silence 1, the focus was always on two requirements: minimize noise and minimize system temperatures. Substantial effort was thus invested to minimize the noise levels. The side panels and top cover are fitted with specially designed, noise reducing insulation materials to minimize and absorb any noises. The solid front doors use sound absorbing materials contribute significantly to the most effective noise reduction achieved by the Deep Silence 1. The hard disk drives are mounted using rubber suspension, in order to absorb vibrations that might arise during startup and to minimize annoying background noises. The power supply rests on rubber mounts, with a suspension frame available on the back. Rubber suspended case feet, crafted in the classy "hi-fi" look, combine with other features to safely contain all vibrations to assure ultra-silent operation of the PC system. The Deep Silence 1 is manufactured from 0.6mm thick steel. By using the highest quality materials, optimal noise insulation is ensured while providing a very stable case. Also responsible for the quietness of the case are the three pre-installed Nanoxia fans of the brand new DS-Series. This most recent Nanoxia fan-series, featuring a new impeller design, was optimized for the best possible mix of silence and cooling capacity. 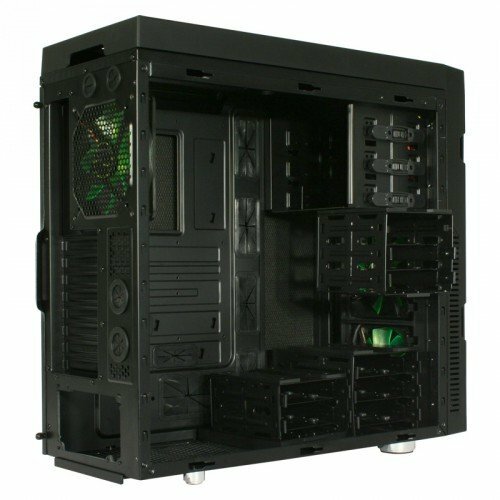 The Deep Silence 1 case is fitted with a 2-channel fan control for up to 6 fans in order to adjust the air flow to the individual needs of the user. The unique Nanoxia Air Chimney is also fitted with noise absorbing materials and can be left closed during normal operations. If need be, the Air Chimney can, as easily as pushing a button, be set to provide passive enhanced case ventilation. As many as three high-quality Nanoxia Deep Silence fans are preinstalled in the case. Behind the front cover, two 120 mm fans rotate at a maximum of 1,300 RPM. The fans are located in special swiveling brackets which allow for simple removal of the fans and easy access to the serial dust filters. At approximately 15 dB(a), the Nanoxia Deep Silence fans generate an air flow of about 59 CFM and a static air pressure of 1.27 mm H²O. Mounted at the back of the case is a 140 mm fan , rotating at roughly 1,300 RMP while generating an air flow of about 69 CFM and a static pressure of 1,08 mm H²O at a noise level of 20.5 dB(a). The Nanoxia Deep Silence 1 offers a variety of very convenient product features. In order to mount up to 8 2.5 inch or 3.5 inch hard disk drives, three fully modular HDD cages are provided. Two of these cages are designed for three HDD and the third holds up to two. In the interests of allowing as much personalization as possible, the three hard disk drive cages can be removed and combined as desired. This way it is possible to accommodate two, three, five, six, or eight data storage drives in the Deep Silence 1. Alternatively, you can put the hard drive cages for two or three drives towards the power supply. Please note that this case no longer permits fan assembly on the bottom; the maximum depth of the power supply is about 200 mm. Due to this unique versatility, the installation of longer graphics cards is possible, even a maximum length of up to an incredible 445 mm is possible. Even if two HDD cages are removed, at least five assembly bays for HDDs remain. When using all of the HDD cages, the maximum length of VGA cards is 315 mm. By removing unneeded HDD cages, the serial front fans can more effectively cool the VGA cards. Of particular interest for water cooling enthusiasts is the ability to accommodate a 280 mm radiator below the steel cover. Compact water cooling solutions can be mounted under the top cover as well. By not using any of the HDD-cages, a 240 mm radiator can be fitted behind the front cover behind the front mounted 120 mm fans. Depending on the motherboard standard, the additional mounting frame can be used to accommodate two or three HDD's. The front USB 3.0 ports can be connected both internally and externally in order to ensure the best motherboard compatibility. A corresponding adaptor is included. The Nanoxia Deep Silence 1 offers a lavish cable management system. All openings in the motherboard tray are fitted with rubber guards. Even when using Micro-ATX motherboards it is possible to hide the cables behind the motherboard tray. The space of Nanoxia Deep Silence 1 is enormous. In addition to graphics cards with a maximum length of up to 315 mm (or 445 mm depending on configuration), all current CPU coolers can easily be accommodated. On the back side are as many as eight PCI expansion slots - the installation of a multi-GPU system is thus possible without difficulty.